Outside the sky hangs heavy over the city in the cold grey of not-quite-spring-not-quite-winter; inside my desk is piled high with approaching deadlines, but my mind is not here, it’s drifted away into sunshine - sunshine and warm tropical waters. Millions of graceful, colorful, mysterious, fabulous, siren songs are beckoning. An especially BIG one is gliding by right now. Yes! Swimming with whale sharks – absolutely the right antidote to a long dreary winter. Have you ever seen one up close? Sharks have had a bad publicist ever since I can remember. Almost anything you read, hear or see about human/shark interaction involves some variation of the “people-as-lunch” theme. But there is another side to this shark story. And it unfolds in a tropical paradise. A huge gentle giant that reaches between 25 and 40 feet in length (9–12 meters), whale sharks weigh up to 47,000 lbs. (21.5 metric tons). These guys are not interested in you, they are krill eaters. They keep their huge mouth open not to terrorize swimmers but to scoop plankton and krill from waters near the surface. Whale Shark Cruising for Krill. Their mouths can be over 5 feet across (1.5m) but as formidable as they look, they are neither interested in eating you for lunch - nor could they manage it if they wanted to - their esophagus is too narrow. Image: Courtesy of ©John Vater, Ceviche tours, Isla Mujeres, Mexico. In fact the opening to their stomach is so small that they couldn’t eat you if they tried, which they won’t. They are actually quite docile and slow enough when “cruising-for-krill” that some swimmers have been able to hitch a ride on their dorsal fins. For the benefit of your health and theirs, we strongly ask you not to touch the whale sharks! 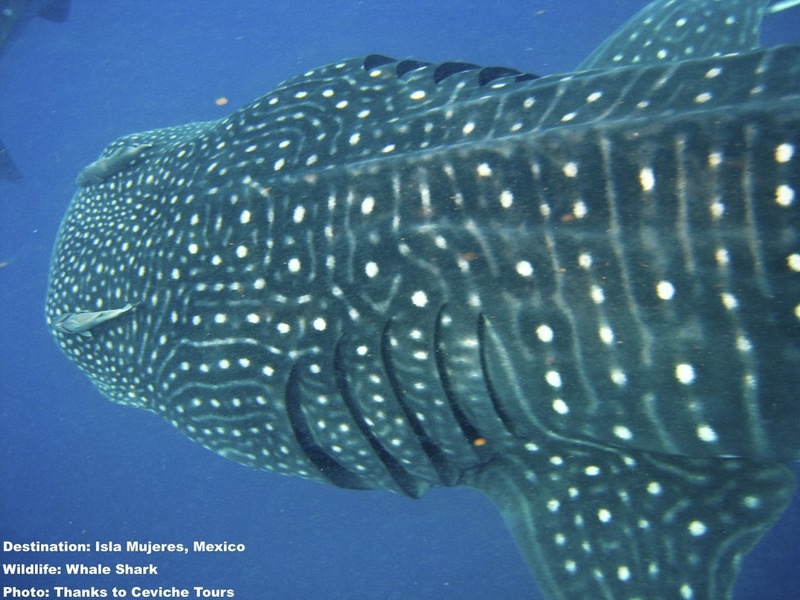 See the end of the article for more on whale shark swimming best practices. While not endangered yet, whale sharks are hunted in Asia and are rated “vulnerable” by the International Union for Conservation of Nature (IUCN). This tail can do serious damage. Annoyed whale sharks have been known to flick their massive tail at something bothering them. Since an adult whale shark can be 273 times the weight of 150 pound (68k) human swimmer, it is best to give them space. Image: Courtesy of John Vater, Ceviche Tours, Isla Mujeres, Mexoco. And hey, if you do give the big guy a little space he’ll probably stick around longer. Use that extra time for some (flash free) underwater photography. Your Facebook photos could end up as part of an on-going worldwide whale shark research project. While not presently accessed as endangered, whale sharks are still being hunted in Asia and are rated “vulnerable” by the IUCN. In many places their numbers are perceived as decreasing by the locals. So where to go when the whale shark urge strikes? individual whale sharks are identified and tracked through their spot patterns. Tourist's photos, gathered at many of the destinations listed below, are a big part of that effort. Image: Thanks to Ceviche Tours, Isla Mujeres, Mexico. These giants feed on microorganisms: plankton and spawn plumes. They migrate constantly, following seasonal blooms through tropical waters all around the equator. In fact, electronic and satellite tracking has shown that individual whale sharks migrate for thousands of miles several times a year conveniently providing ample viewing opportunities above and below the equator in both hemispheres. Start a worldwide whale shark viewing tour and you just may bump into the same shark in multiple locations. So, where should you go to find them? Well, I can think of eight warm and wonderful places right now – Let’s go. Incidentally, most of the destinations listed below are also home to, or cooperate with, research facilities. You can participate in the worldwide studies by simply sending your whale shark photographs into a collection station, The Wildbook for Whale Sharks, individual whale sharks are identified and tracked by their very specific markings - much like our fingerprints. Scroll down for 8 of our favorite Whale Shark places! Bring in the New Year with whale sharks! Tofo Beach is a 5-mile (8 km) stretch along the southern coast of Mozambique on the Indian Ocean. Here is where arguably the largest concentration of whale sharks in Africa can be found, along with some rarely seen rays, hard and soft corals, and a range of reef and pelagic fishes, turtles, and other marine life. This is also home to the Marine Megafauna Foundation (MMF), conceived at a 2004 New Year's Day braai (barbecue) when business partners Malcolm Warrack (owner of Casa Barry Lodge) and Ray Lang stood on the deck of Malcolm's house and watched about 80 whale sharks swimming at the surface. They wondered why? What are these whale sharks all about? They turned that question into one of the most important research facilities for rays and whale sharks on the planet. The Foundation's Dr. Andrea Marshall became known world-wide as the "Manta Queen" after the BBC aired a documentary on her work. Also in residence is the Dr. Simon J. Pierce, PhD, Principal Scientist, and also Science Coordinator for the Wildbook for Whale Sharks and member IUNC Shark Specialist and marine life photographer. He is not called the "Whale Shark Whisperer" for no reason! Visiting Tofo beach is not just about science. There is plenty of fun to be had touring off shore and diving or snorkeling, too. Or maybe you'll find yourself adopting a whale shark, or planning a future volunteer vacation. Enjoy this lovely island! The famous Portuguese explorer, Vasco De Gama visited the city of Inhambane (14 miles / 23 km from Tofo) in the early 15th Century. He liked the people so much he dubbed the city, "Terra de Boa Gente" of Land of Good People. Experience it for yourself. Marine Life Bonus: Manta ray, eagle ray, devil ray, cow nosed ray, bottlenose dolphin, whitetip reef shark and many reef fish, including barracuda, and Spanish dancers. LandLubber Wildlife Bonus: Mozambique has over 600 bird species; look for migratory shore birds and the beautiful Madagascar bee eater. Just north of the equator in the Indian Ocean, the Maldives are a group of about 1,200 islands - only 200 of which are inhabited. Whale Sharks Change Sides with the Weather - So Should You! Whale sharks are a year round visitor here but they change sides with the season. The eastern Atolls are the best place to see them January through April. Ari Atoll is the place to be. Later in the year (May to December) the whale sharks can be seen on the western side and the three protected atolls that make up Baa Atoll, a UNESCO World Biosphere site, are best for whale sharks. The reef structure here is unique to the Maldives and is home to manta rays, sea turtles and clown fish. This is also home to the Maldives Whale Shark Research Program (MWSRP). Their motto: "Conservation through research and community mobilization." Getting the community involved in protecting the species, and helping the local economy by opening the way for controlled tourism - that's our idea of responsible! If you are interested in plunging deeper into the world of whale sharks, learning about these great fish and helping to contribute to their survival as a species, they have volunteer Assistant Research positions on a 2 and 4 week basis. This is hands-on life changing experience. Check out their video below - Then apply here. Marine Life Bonus: Manta Ray, hawkbill, green and loggerhead sea turtles and zillions of colorful fish. Landlubber Wildlife Bonus: Flying fox (which is really a bat), and birds including: White tailed tropic bird, red footed booby, and Amur falcon. A UNESCO World Heritage since 2009, the 14,937,520 acre site (604,500 hectares) includes one of the longest near shore reefs in the world and, on land, a system of karsts, underground caves, and waterways that support incredibly diverse array of marine and land life. This is where the longest running whale shark study takes place and the origin of the data base that has become the Wildbook for Whale Sharks. The small town of Exmouth sits at the tip of the North West Cape. First used as a military base during World War ll, in 1967 the town was established to support a nearby U.S. naval communication station. Today, Exmouth's energy is mainly focused around responsible tourism. Family Time! Whale Shark Fest! Time your visit so you don't miss Exmouth's Whale Shark Festival. This small, vibrant community festival featuring artists, live music, great food, even a "fun run" celebrating the reef and whale sharks has been running on and off for years. The next one is scheduled for May 26-29, 2016. Bring the whole family! 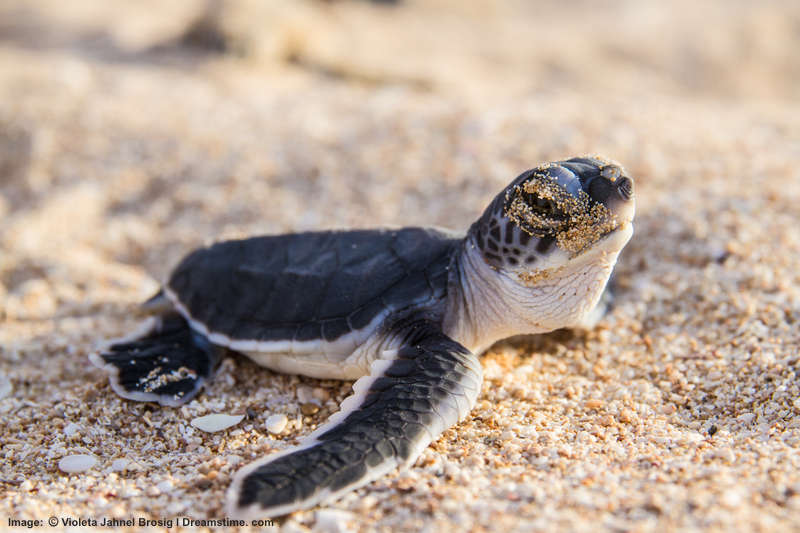 The community of Ningaloo realized that to best protect the three endangered turtle species that nest there, they need to involve and educate the public too. Their turtle program has activities and places to visit for the whole family. One of them, the Jurabai Turtle Center, offers responsible guided experiences to endangered turtle nesting sites as well as turtle education at the Center and even turtle tour-guide courses. Marine Life Bonus: Manta ray, humpback whale and green, loggerhead and hawksbill sea turtles. Landlubber Wildlife Bonus: Emus, kangaroos. Now it is west to the Caribbean! 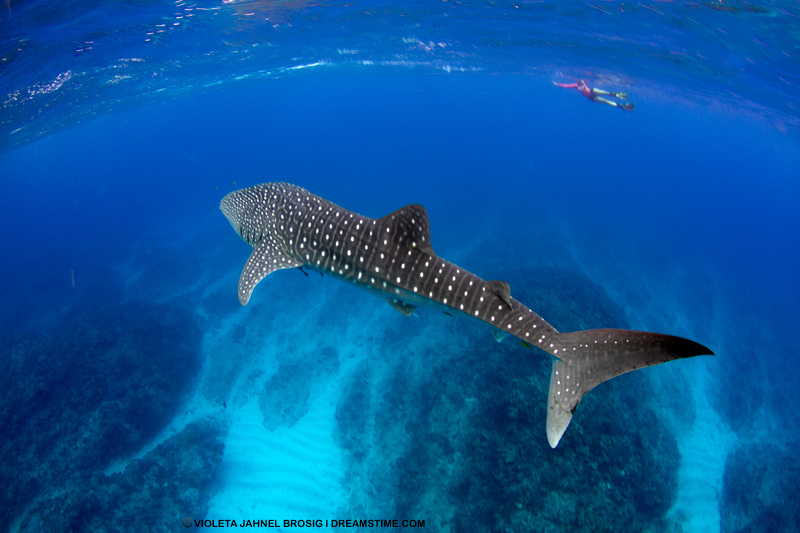 Utila is famous for whale sharks and its Whale Shark and Oceanic Research Center (WSORC). Coming for the fun of it? Contact them for responsible viewing experiences. Or, go deeper! They also offer volunteering and interning opportunities. Utila Island, Honduras is famous for its whale sharks. Looking for a deeper experience in Utila? Volunteer or intern with the Whale Shark and Oceanic Research Center. Image: Thanks to Simon J. Pierce PhD, marine biologist and photographer. The island, located about 18 miles (29 km) from the mainland's port of La Ceile, and less than 7 miles long (11km), is the smallest of Honduras' Bay Islands. While you are there ask a local old timer to tell you about the legendary "Old Tom", a whale shark reputed to be as big as 40 feet (12 meters) ... or 50 feet (15 meters) ... or maybe even 60 feet (18+ meters) long depending on who is telling the story. This big fish has yet to be logged - maybe you will be the first! All visitors are invited to help researchers by donating their underwater whale shark images (no flash, please). Photos donated by volunteers (including tourists!) in Utila can help The Wildbook for Whale Sharks Photo-Identification Library. This is a visual catalogue maintained and used by marine biologists to collect and analyze whale shark sighting data. Over 53,000 photos have been collected and 5300 sharks have been tagged. Thousands of whale sharks from waters all over the world have already been photographed and catalogued. Interested in combining some landlubber wildlife adventure with your whale shark experience? Try some iguana or bat viewing along with your whale shark experience, look into the Kanahua Research center located on the island. 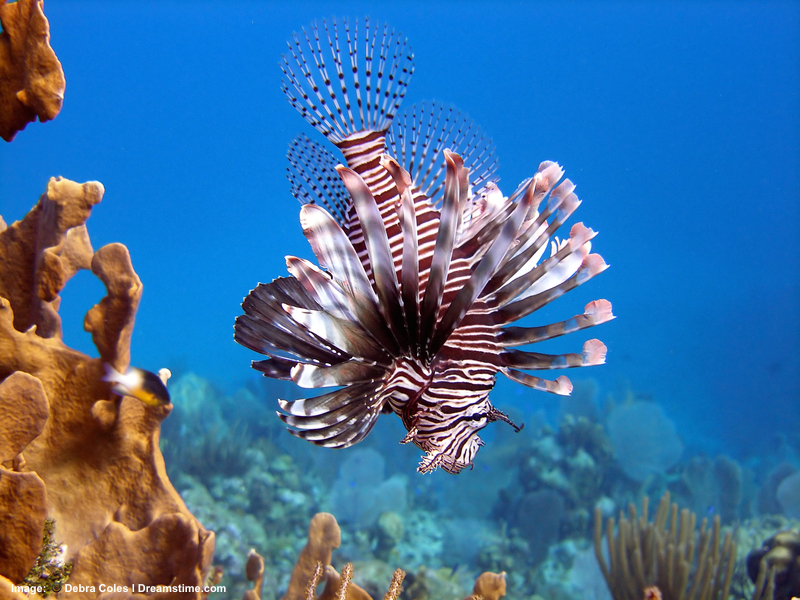 Marine Life Bonus: Spinner dolphins, Spotted eagle ray, Lion fish, Green sea turtles and more. Landlubber Wildlife Bonus: Utila "Swamp" Iguana, and many bat and bird species. Follow the moon - March through June! That’s when snapper and other fish come to spawn. Whale sharks come to feed on the spawn. The Gladden Spit and Silk Cayes Marine Reserve is a protected area of the Southern Belize Reef Complex (SBRC) contained within one of the largest reef systems in the world: the Mesoamerican reef. The SBRC is considered one of the most biodiverse areas in the region and world-famous for its whale sharks. Gladdin Spit, a promontory off a sharp bend in the reef structure, is a critical spawning area for snappers and other reef fish. All that spawning attracts large numbers of whale sharks. In fact, at certain times of the year and phases of the moon it becomes a kind of whale shark cafe! It is the perfect situation for viewing these huge fish. The Silk Cayes are three tiny uninhabited islands that change shape with each tropical storm. 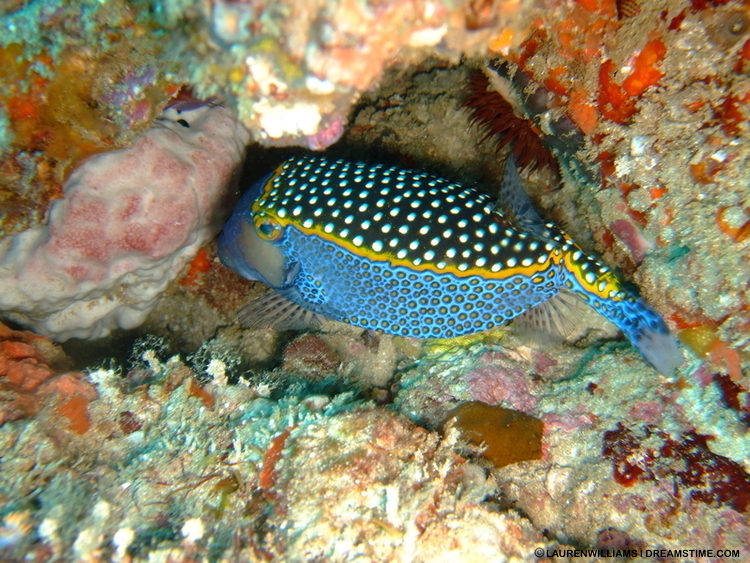 They provide the ideal location for snorkeling and shallow reef diving. Belize has one of the largest coral barrier reefs on the planet. Many of the species, including shark and ray species can be found here. 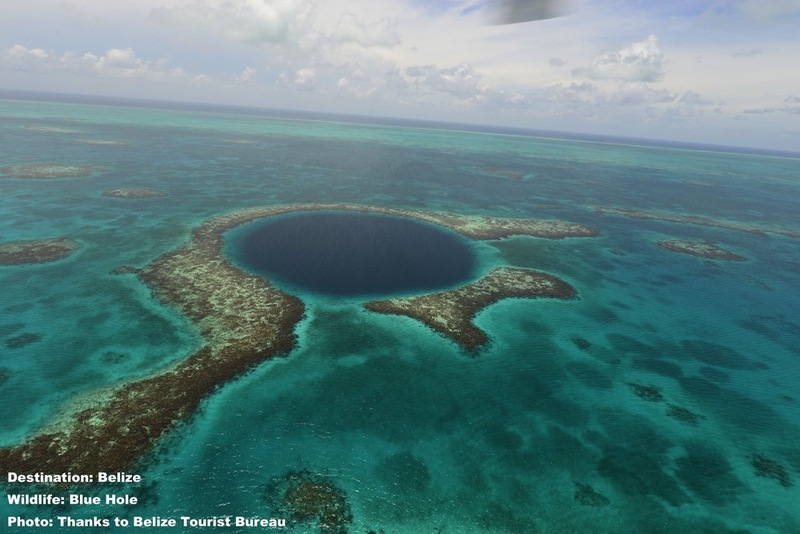 Image: Belize Tourism Bureau. The best whale shark viewing in Belize is from 2 days before the full moon until 10 days after, but they are usually there throughout their season: March through June. There are numerous opportunities here to swim and dive with the whale sharks. Be sure to review the guidelines at the end of the article to help you choose a responsible experience provider. Near Gladden Spit and Silk Cayes Marine Reserve you will also find the 400 foot (122m) deep "Great Blue Hole" made famous by Jacques Cousteau in 1971. His dive brought a lot of enthusiasm and a huge influx of tourists - before the environmental regulations that Belize has now. A 1998 hurricane added into the mix made the site especially vulnerable to coral bleaching, so much so that in 2009 it was added to UNESCO's World Heritage Sites In Danger list. Belize is small country, about the size of the state of Massachusetts, more than half of it is covered in rainforest. If you have extra time go and explore that too. Marine Life Bonus: Blue shark, eagle ray,and zillions of colorful coral reef dwelling fish. Land Lubber Wildlife Bonus: Iguana, and rainforest species: puma, giant anteater. Isla Mujeres, off Mexico's Yucatan coast, is also part of the Mesoamerican or Great Mayan Reef. 1500 year old legend has it that Ixchel, Mayan goddess of the moon, fertility, medicine - and happiness - made this her home. The community of Isla Mujeres, Mexico is one of many world-wide that are changing from fishing/hunting economies to marine eco-tourism based economies - and bringing new life and opportunity to the whole community. Image: ©Ceviche Tours, Isla Mujeres. According to island stories, it was the light shining from her Temple that helped sailors navigate the seas. When the explorer Francisco Fernandez de Cordoba "discovered" the island in 1517 its only inhabitants were Ixchel's priestess and her female retinue. Cordoba dubbed it Isla Mujeres which means, "Island of Women". From kids to their grandparents, there is something for everyone at the Isla Mujeres Whale Shark Festival! Bring the whole family. Image: Ceviche Tours, Isla Mujeres, Mexico. Sometime between 1517 and 2000 much of the the island's local economy drifted into subsistence whale shark hunting. All that is changing as the island turns away from killing the great fish and moves successfully toward responsible marine tourism. The island's fledgling sustainable tourism industry got a boost from New York fashion photographer and long-time Isle Mujeres lover, John Vader, when in 2007 he co-founded Ceviche Tours with his friend of almost thirty years, islander Louis Refugio "Cuco" Sanchez. Together they and Ceviche Tours are committed to sustainable marine tourism as a way to help the environment and the local people. John said it best, "Instead of selling a fish, if you bring people to snorkel with that fish, you can make a sustainable living off of the life of the animal". Indeed - and have some fun too! Ixchel's influence can still be felt in the island's relaxed and happy atmosphere. Isla Mujeres is less than 4.5 miles (7km) long and perfectly located just a ferry ride across the bay from the more built up and sophisticated Cancun. Take a boat tour or snorkel and swim with the great whale sharks who glide through the water scooping up the spawn of thousands of colorful fish. And do not miss the annual Whale Shark Festival! Bring along the kids and their grandparents too - it is fun for the whole family. * Please see end of article for final note on Isla Mujeres and responsible tourism. 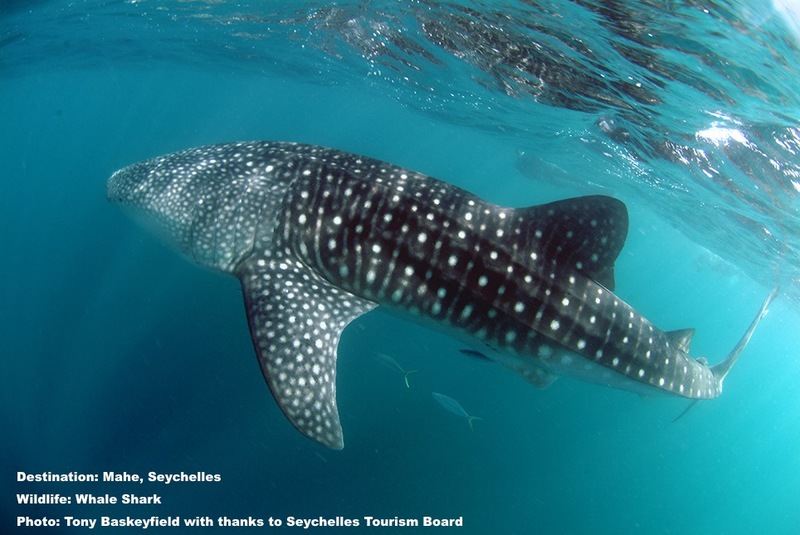 Catch the peak of the whale shark migration in October as they pass along the Seychelles' 115 islands! Whale sharks are sensitive to changes in water temperature. In 2015 they became scare in their traditional migratory route through the Seychelles Islands. It is hoped that with the end of the strongest El Nino in 18 years, the whale sharks will return to these waters. Image: Courtesy of Tony Baskeyfield and The Seychelles Tourism Board. One of the very first studies of whale sharks began here in 1996 with the dual goals of shark conservation and marine ecosystem preservation. The Marine Conservation Society Seychelles evolved from that first study and lead to the protection of whale sharks in 2003. The MCSS, with the help of volunteers, has an active tag and monitor program. They also run snorkeling expeditions. In a Science-meets-Responsible-Tourism benefit they use their monitoring expertise to make sure that you have an excellent chance of encounter. Marine Life Bonus: Ribbon tailed sting ray, hawkbill and green sea turtles nest on the islands. Landlubber Wildlife Bonus: Giant Tortoise, and don't miss the wonderful birds life at Cousins Island. This one-time fishing village at the southern tip of Luzon Island in Sorsogon Provence, was historically economically dependent on subsistence whale shark hunting. But in 1998 the local government decided there was a better way to ensure the economic well-being of its people. Enter the World Wildlife Fund. They, and a number of tourism stakeholders, turned whale shark hunters into marine life spotters, tour guides, and eco-system protectors, raising living standards and proving to the local community that live marine life is more beneficial to their families than hunting and fishing. 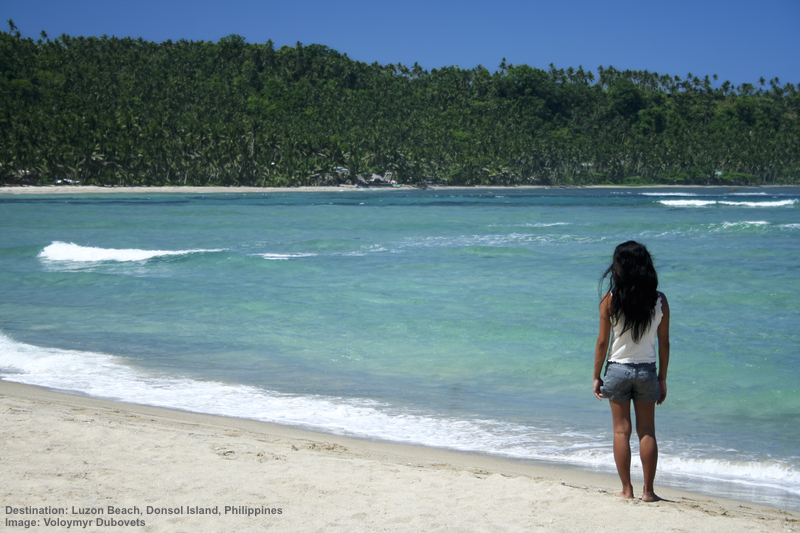 Donsol Bay is now a whale shark protected area. The bay itself has a "no diving - snorkeling only" rule. Not only is this rule good for the sharks, but it is great for shark viewing too. This is where the sharks regularly come to the surface to feed. As long as snorkelers keep their distance, the sharks seem quite content to share their feeding grounds, making for some wonderful, close-up and extended viewing. There is diving nearby at Manta Point. The WWF verifies that, after a couple of years of reduced sightings, as of 2014, the gentle giants are back in force! They continue to work with the village helping to develop additional diverse responsible wildlife viewing opportunities (see below). In fact, according to Mr. Raul Burce: Anchored on the three principles of sustainable ecotourism, natural asset protection, direct community benefit and enhanced visitor experience, Donsol's community-based whale shark ecotourism program stands as one of the best sustainable wildlife interaction offerings in Southeast Asia. While you are there do not miss the opportunity to take mangrove and evening firefly cruises! Can't envision what a firefly tour could be? Imagine a dark sky, a warm breeze and millions of tiny stars flickering all around you. It is magical. 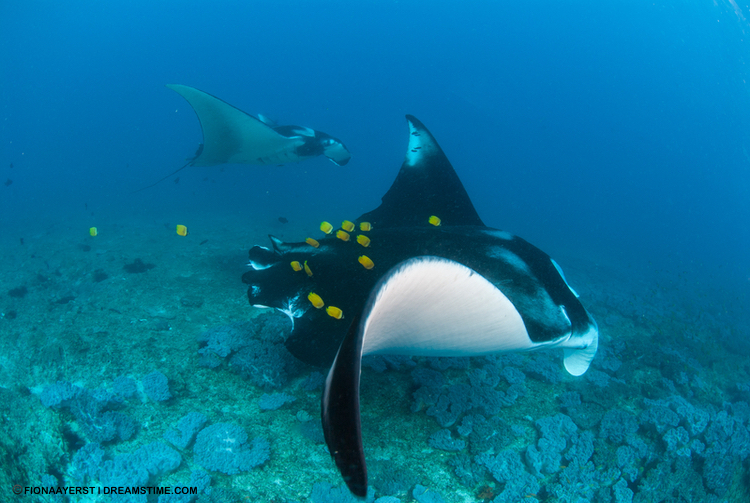 Marine Life Bonus: Manta Rays and zillions of colorful fish. 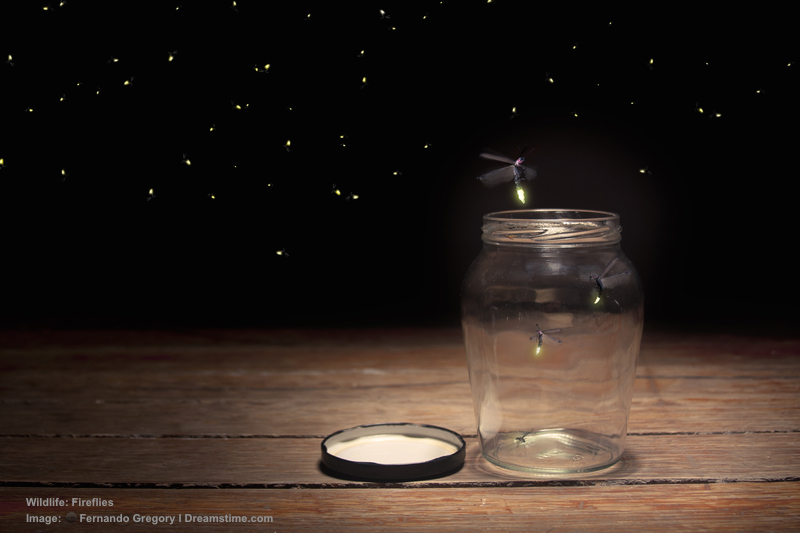 Landlubber Wildlife Bonus: Fire Flies! Be a Responsible Whale Shark Swimmer! Wherever you decide to take the plunge, remember you’re entering the shark’s home. Being a responsible tourist means different things with different animals. ECOCEAN has published a best practices guide for whale shark ecotourism, or watch the new animated video from the Maldives Whale Shark Research Program. So why should we not touch these docile giants? First, whale sharks have a mucus layer covering their skin. It may be “fish slime” to us, but it is important to them to them and can be unwittingly disturbed or rubbed off leading to infection and other health compromises. On the other hand, bothering him can compromise your health too. When whale sharks get annoyed they flick their massive tail. This can result in an unhappy situation for you in open-ocean. At Destination: Wildlife we encourage people to visit places that are endeavoring to work and provide experience opportunities in the most responsible way - that is: in line with today's best knowledge. We encourage you to enjoy them and quietly avoid the others. In this way local communities can still benefit from their responsible tourism initiatives but venues and opportunities that are not responsible will be economically encouraged to change. To be frank, one of our contributors was strenuously opposed including Isla Mujeres on our list. Why? One venue on this small, conservation conscious island advertises swimming with dolphins that "love people" and "want to be hugged and kissed" by humans. Today's research has shown that neither statement is reality. Please do not spend your time and money with a business that offers experiences that are irresponsible and detrimental to the wildlife in their care. Do not swim with captive dolphins. If and when this business reorganizes into a more responsible experience provider, we will be the first to visit and recommend it to you. Progress and research sometimes alters what we believed, at one time, to be true. The people of Isla Mujeres, Mexico have turned their one-time fishing industry toward responsible tourism - and whale sharks are big beneficiary. This is at their annual whale shark festival. Image: Thanks to Ceviche Tours. So, visit Isla Mujeres. Enjoy their nature, marine life and vibrant community. Celebrate in their annual whale shark festival in July. And when you view, snorkel or swim with the whale sharks, or any other marine life, make sure that you - and the experience providers you choose - follow today's best responsible tourism practices. WHALE SHARK Field Guide 1 What is a Whale Shark? Have you had an experience with whale sharks? We want to know! Tell us your story and let's share it with other whale shark adventurers!